Dan Blumenthal participated in the Smallpox Eradication Program (SEP)in Bihar, India in 1974. Dr. Blumenthal began his public health career with CDC. As an EIS officer at CDC, Dan applied to take a short-term assignment with the SEP. Dan describes his daily responsibilities. Later, Dan took a leave of absence from his position at Emory University to become involved with the last efforts to eradicate smallpox in Somalia. 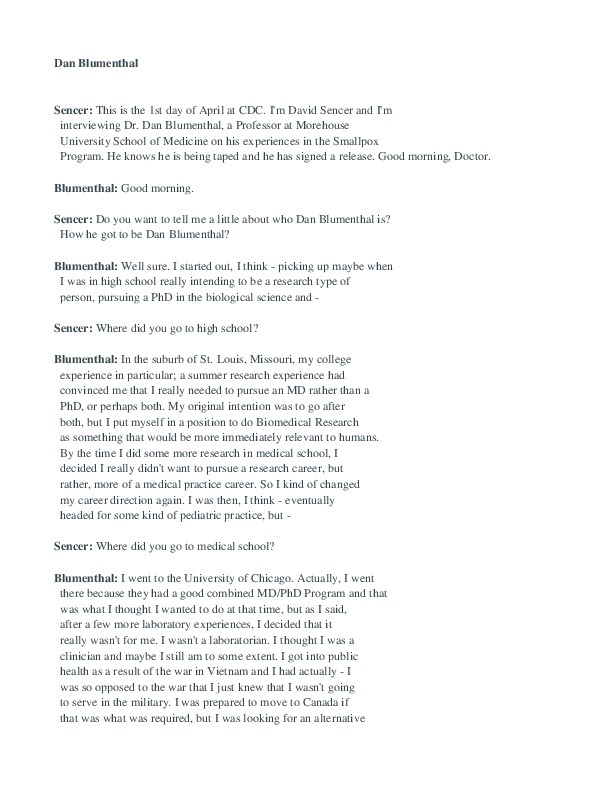 Sencer, David (Interviewer) and Blumenthal, Dan (Interviewee), “BLUMENTHAL, DAN ,” The Global Health Chronicles, accessed April 22, 2019, https://globalhealthchronicles.org/items/show/3513.